Geri Shields: Monster Monday: Mr. Eddie, the Hook Hand Vampire Man! Monster Monday: Mr. Eddie, the Hook Hand Vampire Man! This one, like many here on Monster Monday, will take a bit of explaining. This little dude came about one evening while hanging out on the porch with a few friends. The scenario is one of those "you had to be there" things, but this a short recap of how the legend of Eddie, the Hook Hand Vampire Man was born. Let me set the stage. There were 3 main players: Person A, Person B, and Person C. Person A was wearing an Iron Maiden shirt. Person B was trying to figure out which shirt Person A was wearing and asked, "What's on your shirt?" 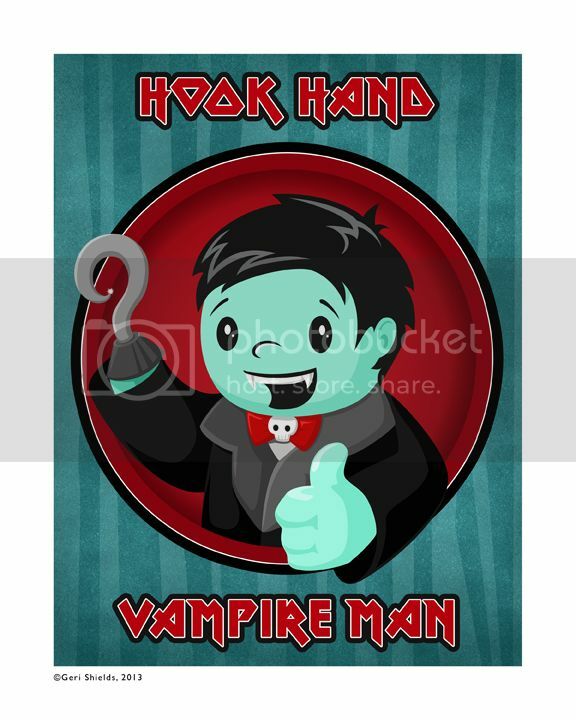 Person C, cough, Shannon, cough, blurted out "HOOK HAND VAMPIRE MAN!" This was a pretty accurate analysis of what was depicted on the shirt, despite the fact that it said "Iron Maiden" atop the picture of "Eddie." Laughter ensued. See, it's definitely one of those "you had to be there" stories. I will leave it at that because the events that followed have sparked much controversy among this particular group of friends. In order to ensure that this memory will never be forgotten I give you my version of the Hook Hand Vampire Man that adorned the shirt in question. My personal version includes a mock Iron Maiden font. The version that will be available in my store shortly will not have the text included. I figure that the image may be confusing enough without the text. Anyway, here he is! Happy Monday!